One thing I love about the world of crafting blogs is discovering so many creative people out there that I normally wouldn't meet. It's really inspired me to try new things and start coming up with things of my own and take chances with projects. 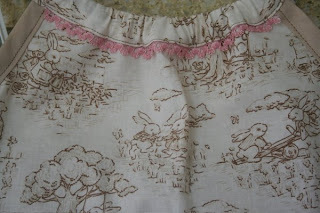 I'd bought this bunny fabric a while back, but was at a loss of what to make with it...until I found this fabulous top design from a fellow crafting blogger. 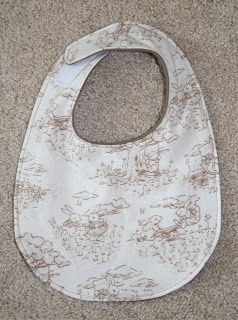 Kristen at fiddlehead was generous enough to come up with a multi-sized pattern so I could give it a whirl for the little lady arriving later this summer. I highly recommend it as it was fun to make from her great directions. I shrunk it down a wee bit so it will fit a very small baby (as more of a dress than a top), but will hopefully work as a top when she gets older too. I'm counting it in my "scrap-made" projects since the pink edging is decorative elastic I had gotten for free with some fabric and the straps & organic mocha pants were made from bits left over from my other projects. Using only materials I had on hand + a great blogger pattern + coming up with a little something myself = great satisfaction AND a new little outfit! Cheryl - This is too cute! 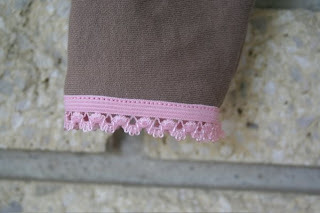 It turned out adorable :) How fun to be sewing for a new baby! Thank you so much for including the link to your blog - I love it and added it to my feed reader.